I don’t usually make Gingerbread houses at Christmas time. They are so cute – and a great family activity. But they’re also super messy. And you have to buy a ton of supplies and then you end up eating all the candy before you put in on the house. That’s why I love this Gingerbread House Gift! 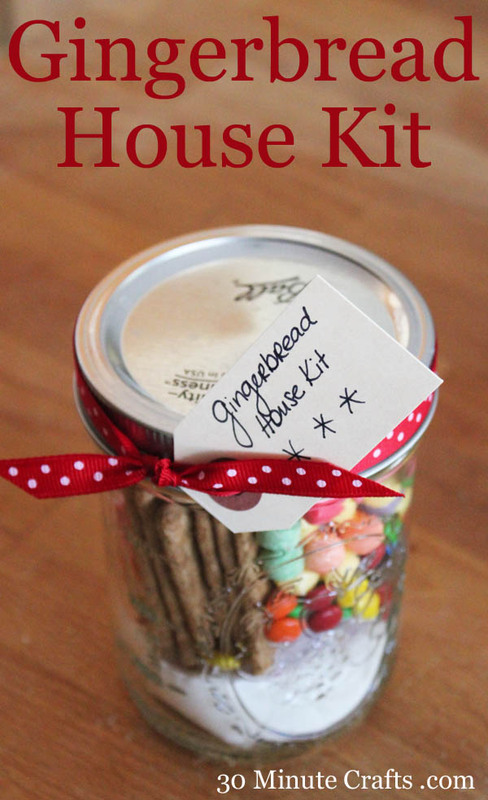 The kit contains everything you need to make a small but super cute Gingerbread house. Even better, you can make these up for gifts and let your friends make up the gingerbread houses! These would be perfect as party favors as well. Head over to 30 Minute Crafts to get all the instructions for putting the kits together. Carolina has so many great 30 Minute Craft tutorials – and she even has 15 minute and 10 minute projects too! You have to love super fast and cute crafts! Do you usually make gingerbread houses with your kids? I’d like to try the kit, it would be the 1st one to make for me.